Fresh breeze from Four Winds. Back again, but who knows for how long, Four Winds Vexillium Imperial IPA. The insistently hoppy IPA reveals notes of Grapefruit and Melon while finishing bitter….yet balanced. 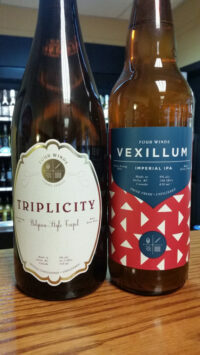 In addition Four Winds limited release of the their Belgian Style Triple. Packing a punch at 9% ABV this extra strong beer is fermented with Lillooet wild desert honey with aromas of spice as well. Definitely one for the tasting! Enjoy a full bodied and flavourful Porter or Stout. We offer some winter warmers from Howe Sound. Feast on the big bold flavour of Pothole Filler Stout or the melted licorice Megadestroyer Imperial Stout. Both are sure to cure what ails you. 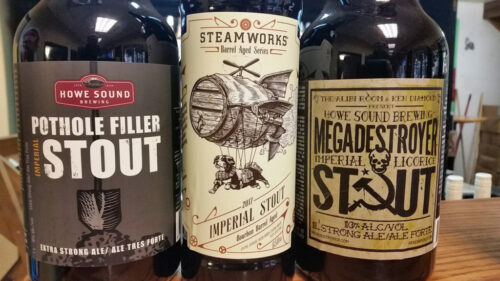 For something a little different there’s Steamworks Barrel Aged Series Imperial Stout. Aged for months in Bourbon barrels this Imperial Stout pours near black with a thick tan head. Drink tonight or lay it down. At 9.5% ABV you might end up doing both! Don’t forget to join the Scots on Robbie Burns Day. 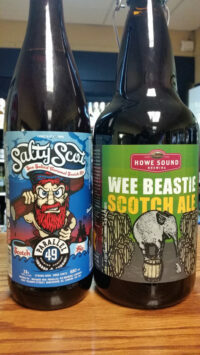 Enjoy Parallel 49’s Salty Scot with a touch of sea salt and caramel or try Howe Sound’s Wee Beastie Scotch Ale. Caramel, roast, raisin, plum, peat and toffee combine to make a smooth complex beverage. Here’s to Robbie!